In an article titled “New Physical Activity Guidelines Urge Americans: Move More, Sit Less” You will find some good tips on how the updated guidelines to get healthier can be easier and less overwhelming. “You’ve likely heard the idea that sitting is the new smoking. Compared with 1960, workers in the U.S. burn about 140 fewer calories, on average, per day due to our sedentary office jobs. And, while it’s true that sitting for prolonged periods is bad for your health, the good news is that we can offset the damage by adding more physical activity to our days. The federal government has just updated recommendations for physical activity for the first time in 10 years, essentially to get that message across. Based on a review of several years of new research, the key takeaway of the new guidelines, released Monday, is: Get moving, America! “The new guidelines demonstrate that, based on the best science, everyone can dramatically improve their health just by moving — anytime, anywhere, and by any means that gets you active,” Adm. Brett Giroir, assistant secretary of health at the Department of Health and Human Services, said in a release. Don’t forget to read more by clicking here. And let’s all get healthy together. 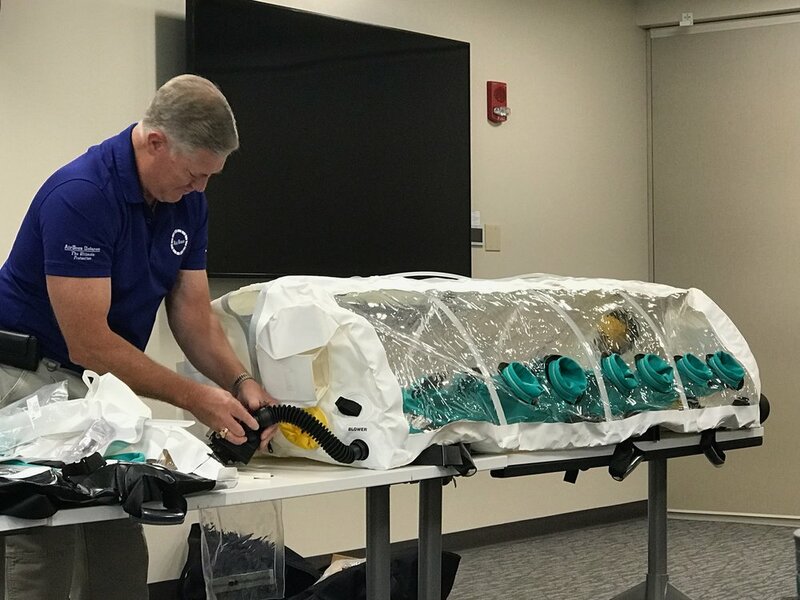 Healthcare and emergency response professionals from throughout the Basin met Wednesday morning at Ashley Regional Medical Center for a special training hosted by the Uintah Basin Healthcare Coalition. Gary Hall, from Global Preparedness, LLC, provided ISO-POD training. An ISO-POD is a portable vinyl enclosure that creates a negative airspace to transport patients with biologically infectious diseases. The unit is used to quarantine an infected person in cases like Ebola, Influenza, or other highly contagious diseases. It also allows first responders and medical staff to treat the patient without contaminating ambulances or areas passed within the hospital during transport. Thankfully, the ISO-POD can also be decontaminated and reused. In attendance at the training were representatives from Jensen Fire, Gold Cross Ambulance, Ashley Regional Medical Center, Uintah Basin Healthcare, TriCounty Health Department, Bureau of Land Management, Uintah School District nurses and other area partners.